The map above shows which countries use their own currencies and which don’t. The best known example of countries not using their own currency is the Euro, which is used by 19 of the 28 member states of the EU. These are: Austria, Belgium, Cyprus, Estonia, Finland, France, Germany, Greece, Ireland, Italy, Latvia, Lithuania, Luxembourg, Malta, the Netherlands, Portugal, Slovakia, Slovenia, and Spain. However, the Euro is not the only example of a currency used in multiple countries. West African CFA franc: Used by 8 countries in West Africa: Benin, Burkina Faso, Guinea-Bissau, Ivory Coast, Mali, Niger, Senegal and Togo. Central African CFA franc: Used by 6 countries in Central Africa: Cameroon, Central African Republic, Chad, Republic of the Congo, Equatorial Guinea and Gabon. Also interestingly worth the same as the West African CFA franc ($1 USD = 570; at the time of writing). East Caribbean Dollar: Used by 6 independent countries: Antigua and Barbuda, Dominica, Grenada, Saint Kitts and Nevis, Saint Lucia, and Saint Vincent and the Grenadines. Plus, British overseas territories of Anguilla and Montserrat. CFP franc: Used in the French overseas collectivities of French Polynesia, New Caledonia and Wallis and Futuna. Other countries will sometimes use their own currency but also allow have other currencies that are in wide circulation / widely accepted (often US Dollars, Euros and/or neighbouring country’s currency). 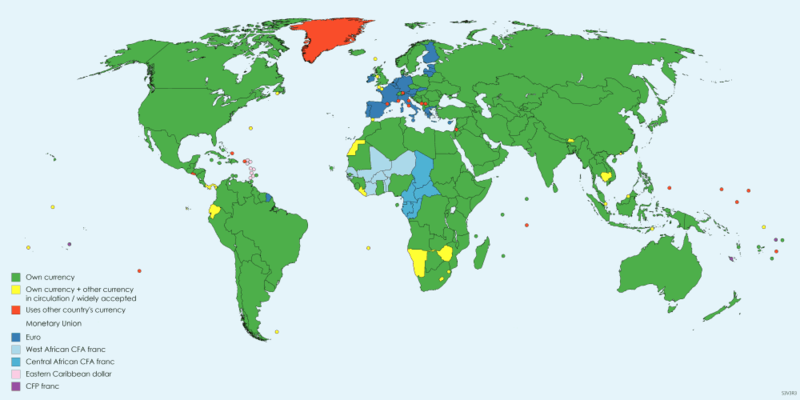 First of all, the criteria that have been used to decide which countries and territories go into which category (or get shown on this map at all): these are current UN member states plus some non-member states (Vatican, Palestinian Territories, Western Sahara, Cook Islands, Niue), as well as those dependent territories that either have their own currency or use a currency that is different from their sovereign state’s currency. I chose to ignore those currencies that are minted or printed only as commemorative banknotes or coinage, which, while being legal tender, are not used in day-to-day commerce. Additionally, some dependent territories that use some third country’s currency alongside its own or its sovereign state’s currency (i.e. Bermuda, a British Overseas Territory, uses both its own dollar and the US dollar; Saint Pierre and Miquelon, a French Overseas Collectivity, uses both euros and the Canadian dollars). As for the dependent territories, I’ve shown only those that use some third country’s currency that is different from their sovereign state’s currency (e.g. British Indian Ocean Territory, Turks and Caicos Islands, and British Virgin Islands are all British Overseas Territories that use the US dollar instead). For practical reasons, I didn’t show those dependent territories that use its sovereign state’s currency – except for Greenland, which is too big not to show on the map. I like it nice and red. A note on the two CFA francs: the CFA franc was created in 1945 (there’s a long story to how and why this happened) and was set at fixed exchange rates against its French counterpart; both CFA francs are now fixed against the euro, and are guaranteed by the French treasury. The two currencies are widely assumed to be at parity and effectively interchangeable across all 14 countries, but they have different monetary authorities, so in principle they are separate currencies. Sources: this list was the starting point. National banks websites and other online sources to check the up-to-date status. There might be some obsolete information, so any corrections are welcome. Enjoy this map? Please help us by sharing it. This map is based upon a biased definition of the word “own”. Bosnia, for instance, uses the Convertible Mark (previously Deutschmark) and Montenegro uses the Euro. great map. You can put both Lebanon and the Democratic Republic of Congo in yellow: they use both their own currency and the US dollar.